Q. How we can stay focused in this great calling that God has given us? It’s said of Eagles that they fly very high and don’t fly in groups. And they can see a prey from 5kms. The wind, other birds, even the rain doesn’t affect the eagles. It is completely focused on its goal. We become effective when we are selective. The world steps aside to let those pass who know where they are going, who are focused. Even a slight deviation can be disastrous. In March 6, 1987- Eamonn Coghlan, the Irish record holder for 500 m race was running in Indianapolis in a qualifying heat. With 2.5 laps left, he tripped. He managed to get up and catch up with the others. Just as he was about to cross the finishing line, he came onto the inside and relaxed because there was no one nearby. But he did not see that there was someone running on the outside that overshot him and finished the race seconds before him. All his efforts were rendered useless because he lost sight of the finishing line. In Hebrews 12:2 we are called to fix our eyes upon Jesus who is the author and finisher of our race. We all have goals in life. What was Paul’s goal? Philippians 3:10- I want to know Christ. This was his burning desire. He’s not saying this at the beginning of his life, but at the end. He was a great pioneer and at this stage. He encountered Jesus in a very dramatic way, but he still lives with the longing to know Christ. When God touched Paul’s life on the road to Damascus, God talks about his purpose for Paul’s life. In Acts 9:15- he says to Ananias “Go! This man is my chosen instrument to proclaim my name to the Gentiles and their kings and to the people of Israel.” Paul’s goal in life is that for which God has taken hold of him at Damascus. Q. How can we remain focused till we cross the finish line? 1. We need to have a clear perspective of the race in which we are involved: in verse 12, we see that Paul has not reached his goal. This is our starting point. In Philippi, there were those who felt like they have already arrived. But Paul says that it is not so. “Not that I have already attained.” Then he says, “or am already perfected”. Paul says he is still a work in progress. That is what we all are. All of us who have met Jesus have begun that race. You and I are not called to settle down in our spiritual walk. We are called to be sojourners. There is a long way to go to attain the purpose for which God has called us. Elijah after Mount Carmel when he was threatened by Jezebel says I’ve had enough, I give up. But the angel of the Lord says to him that he still has a long way to go. In our Christian walk, we attempt to settle down because of various reasons. But we walk with the Lord. This is just a beginning and we are a work in progress. 2. To press on: In verse 14 Paul says that he wants to press on. The Greek word means persecute. The root word comes from ‘chasing’- As a hound chasing a fox relentlessly. That is the picture Paul has in mind when he talks about pressing on. There is urgency in taking hold of that for which God took hold of us. It’s very important that our goal is the same as God’s goal for us. William Wilberforce when was discouraged because of his defeat in his fight against slavery, he opened his bible and a small piece of paper- a letter by John Wesley- fell out of it. It said, “unless the divine power has raised you up, I see not how you can win in your battle against that abominable practice of slavery. Unless God has raised you for this very thing, you will be worn out by the opposition of man and the devil. But if God is for you, then who can be against you? Are all of them together stronger than God? Be not weary of well doing. Go in the power of his might.” He later on succeeded in the abolition of slavery in England. The Christian walk is not our decision to follow Christ. It is God’s plan in our lives- his calling and work in our life. We run the race because God asked us to run this race for him. Therefore we are not our own. He brought us with the precious blood of Christ. That’s foundational. That’s how we need to press on. Q. How do we forget things? Paul says he refuses to live in the past. We cannot wipe out the past- the hurtful things that have happened. But we chose not to look back, not to remember. We choose to look forward.We need to forget both our past failures and our past achievements. We also need to forget about our achievements. We like to live on how God worked in our life and our own achievements in life. Paul had a great heritage. He came from a good family background, but he says, what things were gain to me, I have counted them as loss for Christ. We have to forget those things and look forward in our race. 2. Straining toward what is ahead: Thomas Edison, in one experiment, he needed one thing, for which he searched the whole of Ceylon, Burma, China until he found that material he needed for the filament and his experiment became a success. We are called to strain towards the call for which God called us. In 1 Corinthians 9:24-27 Paul gives the example of a boxer. Paul talks about the discipline and strict training that is involved in our Christian walk. Q. What are some of these disciplines? It is our personal quiet time, prayer life and fellowship with one another. How are things in your life? Are you struggling with them? Or are they completely neglected? These things help us grow in the Lord. In a race, the winner is decided by a fraction of a second’s difference where one person pushes himself ahead by just that much. 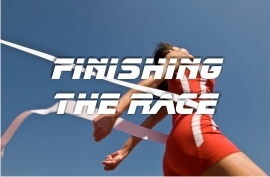 In our Christian walk, we are called to cross the finishing line. Q. What is the motivation? Paul says, I run towards the prize that is set before. The prize is not only for winners but for all those who finish the race. We need to be focused till we finish the race. In 1968, the Olympics were held in Mexico City. The ceremonies were all over. The spectators were prepared to leave. When the public announcer asked them to remain in their seats they were surprised. John Stephen from Tanzania, covered in blood, was a marathon runner entered the stadium. He had fallen down halfway and hit his head on the pavement, was trampled on by the other runners. Then he got himself up and reached the stadium. That’s the calling of God in our lives. May the Lord help us, the one who is so faithful in calling us, will help us complete the race for which he has called you and me.